In this weekend following Thanksgiving, we knew that you’d be looking for something other than turkey. And we had all the proof you needed on this live broadcast from Proof Artisanal Pizza & Pasta! Our celebrity co-host was 2014 Iron Chef of Tucson John Hohn of Gap Ministries, who spoke about the work being done that’s making a difference in the lives of others. We also welcomed beer industry celeb Caleigh Snyder who chatted about her new blog, “Hold My Beer.” We sipped into the next segment with Proof bar manager Alec Marsh, who discussed his cocktail program along with a favorite Old World wine that pairs perfectly with pizza. 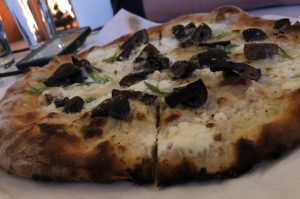 The mushroom pizza, with garlic crema, roasted mushrooms, goat cheese, Grana Padano, scallions, and truffle oil. That’s Proof! Executive Chef Anthony Coluci then shared some stories about the artisanal approach to pizza and pasta, and owner Grant Kreuger talked about a creative way to tie each of his three concepts in St. Philip’s Plaza together! 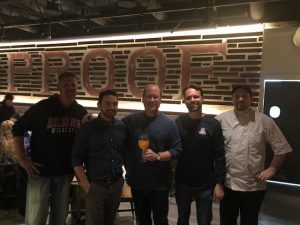 Proof is a palate-worthy culinary and cocktail experience!